1、VMM: more work on improving the emulation of certain MSR registers on certain host CPUs. 2、VMM: fixed single-stepping for real-mode guests (VT-x without unrestricted guest execution) and some I/O instructions. 3、VMM: fixed a potential problem with COW pages if nested paging is not available. 4、GUI: Mac OS X: experimental native full screen support for Mountain Lion and Mavericks. 5、GUI: Mac OS X: removed the mini-toolbar minimize button which doesn’t work under Mac OS X full screen mode anyway. 6、GUI: experimental HID LEDs synchronization for Windows and Mac OS X hosts: fixed keyboard re-synchronization if the feature is disabled. 7、GUI: fixed a potential crash when opening the preferences menu. 8、OVF: fixed a crash of the VirtualBox Manager when re-starting guest export. 10、HGCM: fixed a problem with saved states which could cause several guest misbehavior after a VM was started from a saved state. 11、Storage: fixed a bug preventing to compact differential snapshots under certain conditions. 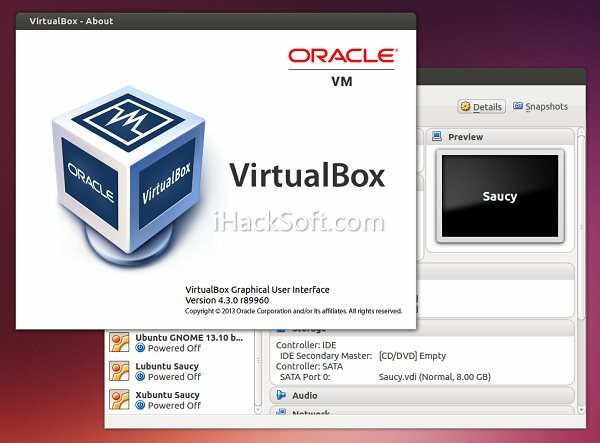 12、VBoxSVC: fixed a segmentation fault on Linux hosts if a very long path exists under /dev. 13、API: fixed guest misbehavior under certain conditions if a storage medium was attached or removed at VM runtime. 14、Windows installer: make the –silent parameter work again. 15、Mac OS X Networking: prevent local traffic (VM-to/from-host) from leaking to wire. 16、Windows Additions: fixed the environment for guest processes. 18、Linux Additions: install correctly on Ubuntu guest systems with a /usr/lib64 directory. 19、X11 Additions: fix for the VBoxClient process not exiting correctly (bug #12348) and consuming too much processor time. 人机验证：4 + 8 = ?